1.1 What Buddha day are you? Blue text is a repeat from our Travel Thailand website. Theravada Buddhism is the professed religion of more than 90 percent of all Thais and casts strong influences on daily life. Buddhism first appeared in Thailand during the 3rd Century B C at Nakhon Pathom, site of the world’s tallest Buddhist monument, after the Indian Buddhist Emperor Asoka (267 – 227 BC) dispatched missionaries to Southeast Asia to propagate the newly established faith. Besides moulding morality, providing social cohesion and offering spiritual support, Buddhism has provided incomparable artistic impetus. In common with medieval European cathedrals, Thailand’s innumerable multi-roofed tem ples have inspired major artistic creations. Another reason for Buddhism’s strength is that there are few Thai Buddhist families in which at least one male member has not studied the Buddha’s teachings in a temple. It has long been a custom for Buddhist males over the age of 20, at one time in their life, to be ordained for a period ranging from five days to three months. This usually occurs during the annual Rains Retreat, a three-month period during the rainy season when all monks forego travel and remain within their temple. Besides sustaining monastic communities, Thai temples have traditionally served other purposes – as the village hostelry, village news, employment and information agency, school, hospital, dispensary and community centre – which give them vital roles in Thai society. 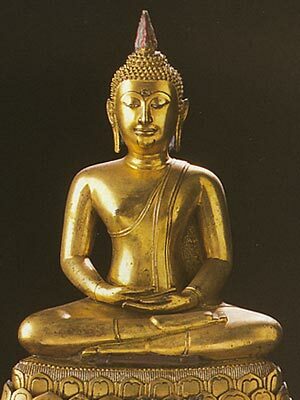 Certain events in the Life of the Buddha are thought to have occurred on certain days. The Buddha Images representing these events, are thus also associated with the days on which they occurred. People who are born on a certain day of the week, may be most interested in a Buddha Image corresponding to that day (like when commissioning a Buddha image). In Pensive Thought. The enlightened Buddha stands with hands crossed over his abdomen (right hand over the left). The Buddha contemplates his achievement of complete knowledge under the Bodhi tree. After enlightenment, the Buddha stood still for seven days under the Bodhi Tree to contemplate the suffering of all living things. He was tempted to enter Nirvana at once (By Mara), but he wants others to know the true doctrine, and resolves to communicate his doctrine to others. Preventing Calamities (This Image is Similar as the Image for 'Stopping the relatives from fighting'). The city of Vesali was tormented by three evils : poverty, cholera and devils. Devils were roaming the city feasting on dead bodies and even people. The King of Vesali was advised to seek the help of the Buddha. The Buddha stops the relatives from fighting or pacifying his relatives. When the Buddha came back from Heaven, he found that his relatives were quarreling about the right to use water from a river for their rice fields. The Buddha encouraged them to compromise and said that human life is much more valuable than water and it was not worth killing men for water. Then, his relatives stopped fighting. Reclining Buddha - Left arm along the body, right arm serves as a pillow with the hand supporting the head. Story : The giant Asurindarahu wanted to see the Buddha, but was reluctant to bow before him. The Buddha, while lying down, presented himself as much larger than the giant. He then showed him the realm of heaven with heavenly figures all larger than the giant. After all this, Asurindarahu, the giant, was humbled, and made his obeisance to the Buddha before leaving. Image at Phra Pathom Chedi, Nakhon Pathom province. The Buddha is standing with both hands around an alms bowl. This symbolizes the first morning. The Buddha holds an alms bowl. The Buddha visited his family after four years in the monastery. 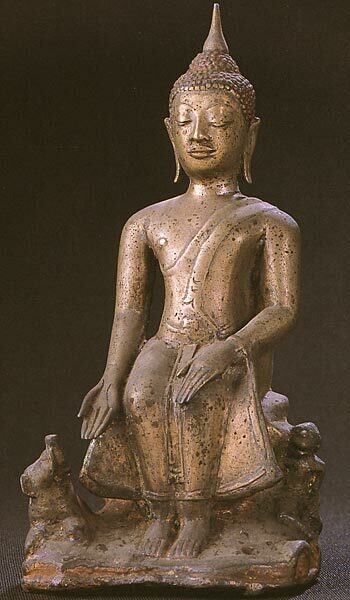 His father was not content when he saw the Buddha “begged” for food holding an alms bowl. Buddha explained to his father that performing pindabat, or holding an alms bow are the lineage of Buddha. Thus, the disciples can devote their food. The virtue of giving amongst Buddhists is strong until today. Meditating Sitting in the yoga posture. Note the right leg on top of the left, the right hand on top of the left hand. The Bodhisattva makes a vow and is determined not the leave the spot (where he is sitting on the grass) until he achieves enlightenment. The Boddhisattva determines to find the cause of suffering and its cessation. The Buddha is in meditation. This is the perfect mental discipline. The gesture is the ultimate balance of tranquility and thoughts. It is believed that the body in the position is receptive to power or energy to enter the body from the top of the head and the opening palms. protected by Mucalinda's cobra hood. 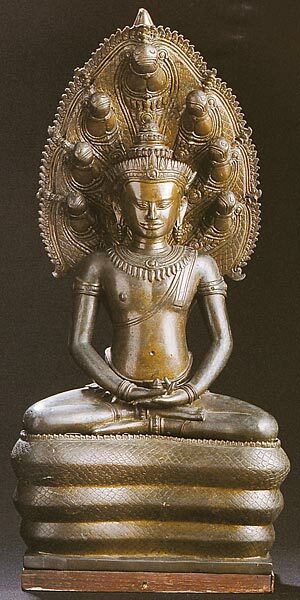 (Mucalinda is King of the Naga) The Buddha is in meditation and protected from a storm by Maculinda, the King of the Naga. The image is related to the moment when a naga spreaded its hood to protect the Buddha from a rainstorm while he was in profound meditation. What Buddha day are you? a Buddha for each Day .. which is you ? ..... what day you were born ...???? you on an adventure to the world of precious amulets, venerable monks, events, cultural, rituals and more.